Engineered for superior strength, moisture resistance and quality so you can build the quiet, stiff floor your homeowners demand. For more information visit these great sites. Find these and other fine products at your nearest Herrman Lumber location. Engineered building material just maybe some of best stuff to come along in a long time. It's straighter, stronger and easier to work with and it's in stock at Herrman Lumber Company. onCENTER Engineered lumber offers builders, designers and developers the flexibility to create almost limitless open floor plans in commercial and residential projects. Its superior strength over dimension lumber and consistent uniform properties make it the top choice of building and design professionals. With the more efficient use of faster-growing wood species, engineered lumber meets environmentally friendly standards. 50-year limited warranties. Visit the award winning AdvanTechperforms.com/a website for complete information and find out why AdvanTech is........ the FLAT OUT BEST CHOICE. ZIP System® wall combines the strength and stability of a high-performing panel with the enhanced weatherability provided by the product's water-resistive barrier. With an instant 120-day rough dry-in, you can schedule your subcontractors sooner, and you’ll never have to worry about housewrap tearing off or blowing away. ZIP System® roof sheathing is a structural panel with a built-in Precipitek™ moisture resistive barrier that eliminates felt paper and H-clips. Simply install the panels, tape the seams and you have a structural roof system and code-recognized underlayment all in one. Shingles and other approved roof coverings can be applied directly on top of the ZIP System roof! ZIP System® roof and wall panels provide a tight envelope and curb appeal during the construction process. Once the panels are installed, the seams are sealed with specially designed ZIP System™ tape. This innovative solution eliminates the need for housewrap and felt, saving you valuable time and money while yielding superior moisture management and a tighter building envelope. ZIP System tape helps reduce air leaks as recommended by ENERGY STAR® and is code-recognized as window and door flashing tape when used with ZIP System wall. As with ZIP System roof and wall panels, ZIP System tape is backed by our limited 15-year system warranty. 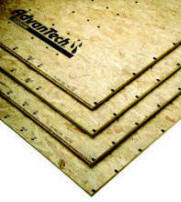 AdvanTech® the AdvanTech® logo, ZIP System™ and the ZIP System™ logos are registered trademarks of Huber Engineered woods LLC. Huber is a registered trademark of J.M. Huber Corporation.